A fire pit can be a great focal point in any landscape, from a private backyard to a dining area for a restaurant. The design and execution of these firepits will do a lot to influence not only their uses and appearance, but also the requirements and restrictions from Massachusetts’ and its various counties’ law when it comes to the construction and operation of these firepits. Let’s look at the materials that go into a fire pit, and how the change affects the construction requirements and timeline. Your fuel source is going to dictate a lot about your fire pits capabilities and requirements, so it’s important to spend some time thinking about it. Wood Burning Fire Pits: The easiest type of fire pit is the wood-burning variety. Construction only has to account for containment of the fire and its embers. And while the smell and sound of fire isn’t something a gas-burning fire pit can reproduce, it’s important to keep in mind its smoke, sparks, and susceptibility to wind and rain. Propane Fire Pits: Propane fuel fire pits have the advantage of easy startup, all weather functionality, no smoke or sparks, and burning hotter (in volume) than natural gas. However, it’s important to note that construction is more expensive for the need of a tank installation, and propane is also more expensive than natural gas. Natural Gas Fire Pits: Natural gas fire pits share many of the same properties as propane, including easy startup, all-weather ability, and no smoke or sparks. Also, natural gas can be piped in (especially useful if you already have a natural gas hookup on the property). Design considerations fall into two parts: the hardscape and the fire pit itself. Hardscape refers to the design and build of hard elements of a landscape (as opposed to the soft ones like plants and soil). Here, it’s about the stonework of the pit and the materials chosen. For example, if this firepit is being built on a patio, it’s important to use similar or complementary types of materials, like manufactured stone such as Unilock or natural fitted stone as a veneer or complete construction. The firepit itself differs depending on your choice of fuel source. While a firepit only requires installation of a stone, ceramic, or metal container for the wood and embers, a gas fuel source will also require an ignition device as well as fuel lines, with gas lines will also have to be dug for both natural gas and propane. Make sure to check out our blog, Fire Pit Landscaping Ideas for Your Backyard, for more ideas on firepit design. 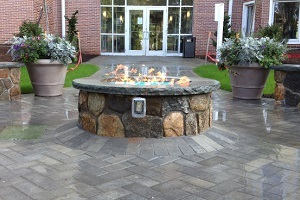 The regulations in Massachusetts when it comes to firepits are dependent on the type of fuel source to decide to use. A wood-burning fit pit, assuming it’s properly enclosed, has few requirements. Generally speaking, it should be 10 feet away from structures, trees and bushes, and overhead power lines. If you decide on a gas line, you’ll have to get a building permit, as well as contacting your local building inspector and fire department. While they may impose additional restrictions, these fire pits need to be 20 feet away from structures and other obstructions. Here at Greener Horizon, we’re experts when it comes to designing and building hardscapes, especially fire pits. We’re fully licensed and insured contractors with expert knowledge of state and local regulations and requirements. Contact us today to learn more, and get a free consultation on your fire pit.